This is a Mickey Mouse as Santa Christmas ornament, featuring Pluto as a reindeer. 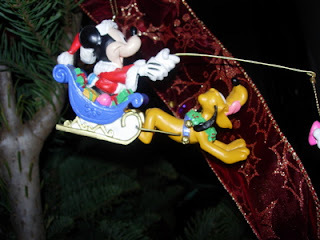 Mickey has a bone on a stick, which is making Pluto pull the sleigh. I didn't know that Pluto could fly, but hey, at Disney, anything is possible!